Well I just bought the April 28th issue of Garden News and Medwyn Williams who is one of the greatest vegetable growers in the world has written a whole article on me and my family run company. I had better not tell you all what the article says but it is very good and I hope you all get a chance to read it. Back out into the garden today and decided I should plant some left over Pixie in a small area of ground in the corner of the garden. It was so simple to do. I simply dug a trench 10 feet long and popped a potato in every 12 inches apart and covered with soil. In the next week or so we hope to have a flat rate postage system for upto 20kg in place for N.Ireland and all other areas that are normally much costlier to post to. Well we have got off to a good start this year with our commercial seed planting. We are over halfway and have 100 acres planted so far. This time last year we hadn't even started so we are very happy with the progress this year. So far we have planted Arran Pilot, Home Guard, Pentland Javelin, Duke of York, Sharpes Express, Maris Bard, Catriona, Nicola, Wilja, Ulster Classic, Ulster Sovereign, Ulster Prince, Ulster Sceptre, Lord Rosebery, Edgecote Purple, Ryecroft Purple, Gladstone, Pentland Lustre, Peach Bloom, Dark Red Norland, Beauty of Bute, Tuskar, Dobbies Asset, Doon Pearl, Flourball and a few more special ones this year. In my own Garden I have today planted Highland Burgandy Red, Congo, Purple King Edward(Mr Littles Yetholm Gypsey) Salad Blue, Shetland Black, Witchill, British Queen and some Bonnie for showing. Growing potatoes in containers is so easy to do. Give it a try and use my videos to help you have a successful crop. I planted my exhibition potatoes in the garden today. I dug a 4" deep trench that is the width of my shovel and broke the soil up at the bottom. I then added fertilizer to the base of the trench and forked it in. 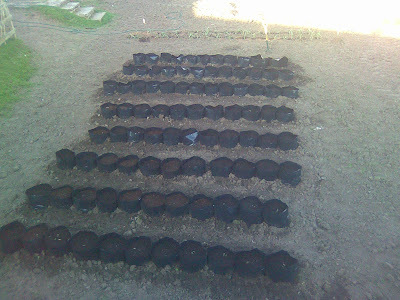 The potato bags were then put in place and the soil was filled back in around the bags and finally I gave them a heavy watering. The potato bags have holes cut in the bottom of them to allow the root system to use the fertilizer that I have added to the soil. As you might have noticed the JBA website has been offline for a few days. This was not to do with any updates to the site but caused by our dedicated fasthosts server failing. We hope all issues have now been resolved and that you can carry on using our site without problem. As I watched tonights show with interest I thought to myself there will be no potatoes on here tonight. Then as if by magic my potatoes appeared on the tv. Maris Peer, Maris Piper, International Kidney and Swift were all on and I hope more will be on soon. I have been looking at adding new potato varieties to my online shop. Are there any varieties that you think I should stock? We mainly sell our potatoes in 2.5kg sack but I also sell 5 tubers of a variety aswell. Is there any other pack size that you think we should offer? Just leave me some comments and feel free to give me any ideas that you have. Our potato planter bags have been a huge success and you can access videos of how to use them by clicking on the videos on the right of the screen. I read on many different gardening forums every day when should I plant my earlies and my maincrops? The simple answer is that you should plant them all at the same time if possible and let nature take its course. Earlies are called earlies because they mature earlier than maincrops. Maincrops take longer to mature than earlies so to make the most of them and avoid blight as much as possible you should plant them early.